Step to This - Enova International, Inc. In the last couple of years, the results of a handful of new studies have shown walking every day to be more beneficial in more ways than were previously known. For example, scientists at the Lawrence Berkeley National Laboratory recently found that walking reduces the risk of developing cataracts. Other benefits reported are lower blood pressure, lower “bad” cholesterol and lower risk of diabetes and heart disease. The American Heart Association even reports that walking enhances mental well-being. Since walking is so healthy and is something we do every day, anyway, Enova is trying to create an environment where we do it even more. Our clever talent management associates came up with a program that includes something they knew would get us all moving: competition. Enovans formed teams that for six weeks will use pedometers to measure their step counts on a weekly basis. Enova provided the pedometers and set employees loose to walk as much as they can, not just to improve their health, but to win. Everyone participating uploads the data from their step counters onto a website that tracks and compares the steps of each team. 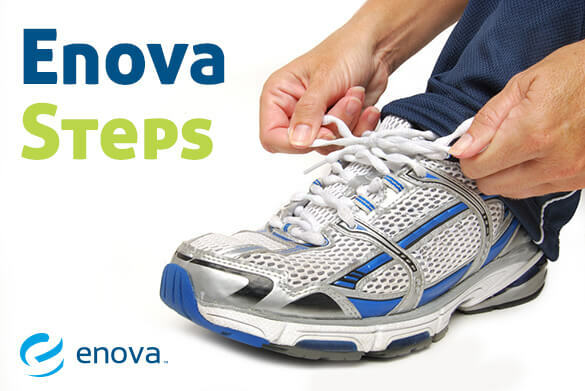 At the end of each week, team captains report the total step count, and prizes provided by Enova are awarded to the highest individual stepper and the most improved individual stepper. At the end of the six weeks, prizes will also be awarded to the team with the highest overall step count and to the most improved team. It remains to be seen what the competition’s outcome will be. Enovans work hard together, but they also play hard. They’re known to get into shape to do obstacle races like the Tough Mudder and the Warrior Dash. Somehow a little competition makes them stick together and in this case, step together.